Red Bull Crashed Ice takes over Edmonton and Local 1325 was there. The snow has long-since melted, but the memories from the 2018 Red Bull Crashed Ice event in Edmonton definitely remain. 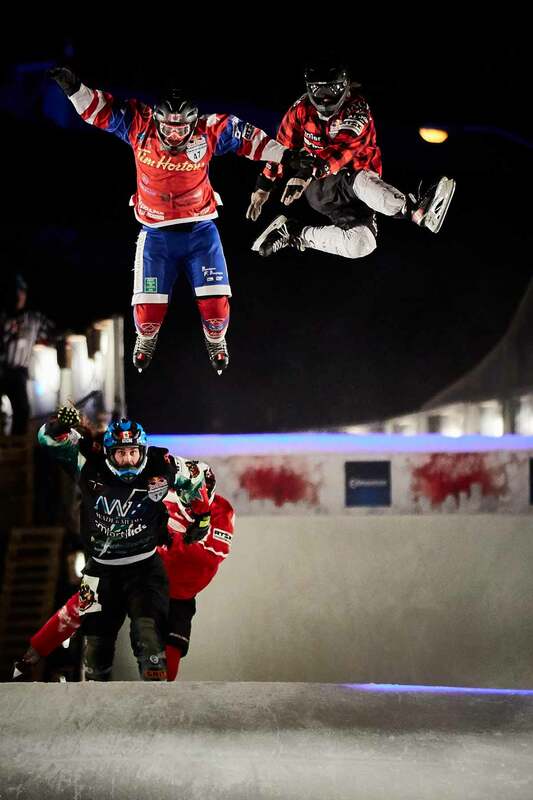 If you’re unfamiliar with the world-touring winter extreme sports series, Crashed Ice involves skaters from 20 different countries descending four-at-a-time at speeds of up to 80km/h on a steep ice track riddled with steep turns, bumps, massive vertical drops of up to 40 metres and plenty of big air. It is similar to ski or snowboard cross, but with skates on an ice track…and instead of a mountain, the course traverses an urban landscape. This past March, that landscape was downtown Edmonton and the Red Bull Crashed Ice event held here was the world championship event of the season. The obstacle-filled 455-metre ice track wound from the east side of the Shaw Conference Centre on Jasper Avenue plunging 40 metres to Louise McKinney Park on the bank of the North Saskatchewan. A workforce of around 175 men and women, including scaffolders from Local 1325, spent over a month assembling the course. About 40 per cent of the track was built on scaffolding and the rest on the natural terrain. A team of 24 icemakers needed six days to make the ice that ranged from eight to 11 centimetres in thickness. A specially made bridge required nearly a dozen heavy steel beams to support the ice and the racers. All totalled, 600,000 pounds of scaffolding, 360,000 pounds of I-beams, 500 Plexiglas sheets, 1,600 feet of plywood and 4,800 feet of polymer were used to make the course. Long, flat hose-like mats with 36,000 litres of coolant coursing through them were laid on the base of the track to ensure it remained frozen, even if by some miracle the outside temperature rose to 20ºC. A team of 24 icemakers sprayed a mist on the track around the clock for six days to make approximately 772 kilos of ice.